The rear view image is displayed when the shift position is in R and the engine switch is in the “ON” position. 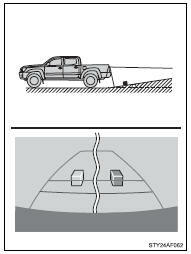 The line indicates a guide path when the vehicle is being backed straight up. The displayed width is wider than the actual vehicle width. These lines indicate the estimated vehicle center on the ground. The line shows points approximately 1.5 ft. (0.5 m) (red) from the center of the edge of the bumper. The line shows distance behind the vehicle, a point approximately 3 ft.
(1 m) (blue) from the edge of the bumper. The rear view monitor system displays an image of the view from the bumper of the rear area of the vehicle. To adjust the image on the rear view monitor system screen. • The area displayed on the screen may vary according to vehicle orientation conditions. • Objects which are close to either corner of the bumper or under the bumper cannot be seen on the screen. • The camera uses a special lens. The distance of the image that appears on the screen differs from the actual distance. • Items which are located higher than the camera may not be displayed by the monitor. 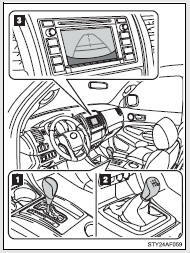 The camera for the rear view monitor system is located as shown in the illustration. If the camera lens becomes dirty, it cannot transmit a clear image. If water droplets, snow or mud adhere to the lens, rinse it with water and wipe with a soft cloth. If the lens is extremely dirty, wash it with a mild cleanser and rinse. The distance guide lines and the vehicle width guide lines may not actually be parallel with the dividing lines of the parking space, even when they appear to be so. Be sure to check visually. The distances between the vehicle width guide lines and the left and right dividing lines of the parking space may not be equal, even when they appear to be so. Be sure to check visually. The distance guide lines give a distance guide for flat road surfaces. In any of the following situations, there is a margin of error between the fixed guide lines on the screen and the actual distance/ course on the road. The distance guide lines will appear to be closer to the vehicle than the actual distance. Because of this, objects will appear to be farther away than they actually are. In the same way, there will be a margin of error between the guidelines and the actual distance/course on the road. The distance guide lines will appear to be further from the vehicle than the actual distance. Because of this, objects will appear to be closer than they actually are. In the same way, there will be a margin of error between the guidelines and the actual distance/course on the road. When any part of the vehicle sags due to the number of passengers or the distribution of the load, there is a margin of error between the fixed guide lines on the screen and the actual distance/ course on the road. The distance guide lines are displayed according to flat surfaced objects (such as the road). It is not possible to determine the position of three-dimensional objects (such as vehicles) using the distance guide lines. When approaching a three-dimensional object that extends outward (such as the flatbed of a truck), be careful of the following. Visually check the surroundings and the area behind the vehicle. On the screen, it appears that a truck is parked at point . However, in reality if you back up to point , you will hit the truck. On the screen, it appears that is closest and is furthest away. However, in reality, the distance to and is the same, and is farther than and . 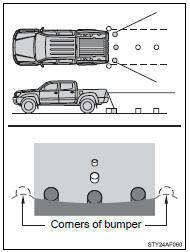 In the case shown below, the truck appears to be outside of the vehicle width guide lines and the vehicle does not look as if it hits the truck. 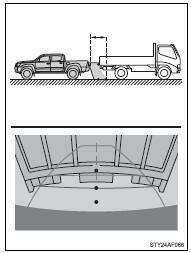 However, the rear body of the truck may actually cross over the vehicle width guide lines. In reality if you back up as guided by the vehicle width guide lines, the vehicle may hit the truck. ●Never depend on the rear view monitor system entirely when backing up. ●Be sure to back up slowly, depressing the brake pedal to control vehicle speed. ●The instructions given are only guidelines. When and how much to turn the steering wheel will vary according to traffic conditions, road surface conditions, vehicle condition, etc., when parking. ●When parking, be sure to check that the parking space will accommodate your vehicle before maneuvering into it. • On roads that are not flat or straight, such as curves or slopes. ●In low temperatures, the screen may darken or the image may become faint. The image could distort when the vehicle is moving, or you may become unable to see the image on the screen. 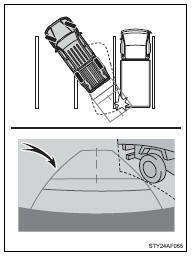 Be sure to directly check visually and with the mirrors all around the vehicle before proceeding. ●If the tire sizes are changed, the position of the fixed guide lines displayed on the screen may change. ●The camera uses a special lens. The distances between objects and pedestrians that appear in the image displayed on the screen will differ from the actual distances. ●The rear view monitor system may not operate properly in the following cases. 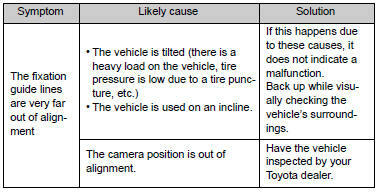 • If the back of the vehicle is hit, the position and mounting angle of the camera may change. • As the camera has a water proof construction, do not detach, disassemble or modify it. This may cause incorrect operation. • Do not strongly rub the camera lens. If the camera lens is scratched, it cannot transmit a clear image. • Do not allow organic solvent, car wax, window cleaner or glass coat to adhere to the camera. If this happens, wipe it off as soon as possible. • If the temperature changes rapidly, such as when hot water is poured on the vehicle in cold weather, the system may not operate normally. 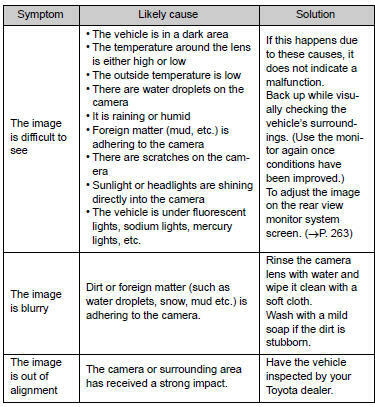 • When washing the vehicle, do not apply intensive bursts of water to the camera or camera area. Doing so may result in the camera malfunctioning. • When the camera is used under fluorescent lights, sodium light or mercury light, etc., the lights and the illuminated areas may appear to flicker. ●Do not expose the camera to strong impact as this could cause a malfunction.